I never realized how Scriptural the Mass was until my first encounter with “Bible Christians.” As a “cradle Catholic,” I was quite familiar with the rituals of the Mass. I knew when to stand and when to kneel. I knew when to say, “Amen,” and when to say, “And also with you.” However, I was never sure about the meaning of all these rituals: where they came from, why we did them, and how they led us into a deeper relationship with Christ. At the time, I did not know how to answer my friends’ concerns about the Mass. But their good questions led me to dig deeper into the faith of my youth and to explore in greater depth the meaning of the Eucharist. In the process, I discovered great treasures in the Mass, which I had never even known existed. Most notably, I began to understand just how biblical the Mass really is. I came to see how practically every prayer, hymn, response, and ritual action is saturated with images, themes, and quotes from Sacred Scripture. At almost every point of the Mass, God’s Word is jumping out in signs, gestures, words, and songs! Let us begin with the most basic ritual that comes at the opening and closing of every Mass: the sign of the cross. While tracing a cross over our bodies, we say, “In the name of the Father, and of the Son, and of the Holy Spirit.” This simple prayer, however, is no empty ritual. In making the sign of the cross, we are performing a sacred biblical action. We are calling on the name of the Lord. Whenever someone calls on the Lord’s name in the Bible, it is a powerful moment. Throughout salvation history, when people make or renew their covenant with God, they call on His holy name in order to invite God to act in their lives and to express their firm commitment to live in covenant with Him (e.g., Gen. 4:26; 12:8; 26:25; 1 Kings 18:24, 32). Following this Biblical approach to worship, Catholics begin each Mass by invoking the name of the Triune God: Father, Son, and Holy Spirit. In so doing, we invite the Almighty God into our lives and dedicate all that we do in the Mass to His sacred name. Furthermore, the ritual action itself of making the sign of the cross on our foreheads has roots in Sacred Scripture. In the Book of Ezekiel, for example, a cross-shaped symbol served as a sign of divine protection. God gave the prophet Ezekiel a vision about the judgment that would fall upon Jerusalem for its idolatry. In this vision, the faithful Jews who were marked with the Hebrew letter taw on their foreheads would be spared when the day of reckoning arrived (Ezek. 9:4). What is significant for our topic is that this Hebrew letter had the shape of a cross. Therefore, already in the Old Testament Book of Ezekiel, being marked with a cross on the forehead symbolized covenant union with God and divine protection. We find this theme continued in the New Testament. Drawing on the Ezekiel image, the Book of Revelation also describes the faithful servants of God in the New Covenant as being marked with a seal on their foreheads. This sign sets them apart as God’s people and protects them from the divine judgment that will fall upon the earth (Rev. 7:3). This helps shed light on the Catholic practice of making the sign of the cross. When we first became Christians, we, too, were marked with the sign of a cross at our baptisms when the priest traced the cross of Christ over our bodies. Therefore, whenever we repeat this basic gesture at Mass, we are retracing the same mark that was placed on us at the beginning of our life in Christ. In so doing, we remind ourselves that we have been set apart by Christ, and we renew our commitment to live in union with Him. As in the time of Ezekiel, the sign of the cross continues to serve as a powerful symbol expressing our covenant with God and His protection over our lives. Dr. Edward Sri is professor of theology and Scripture at the Augustine Institute’s Master’s in Catechetics and Evangelization program in Denver, Colorado. He is an author and well-known speaker around the world. 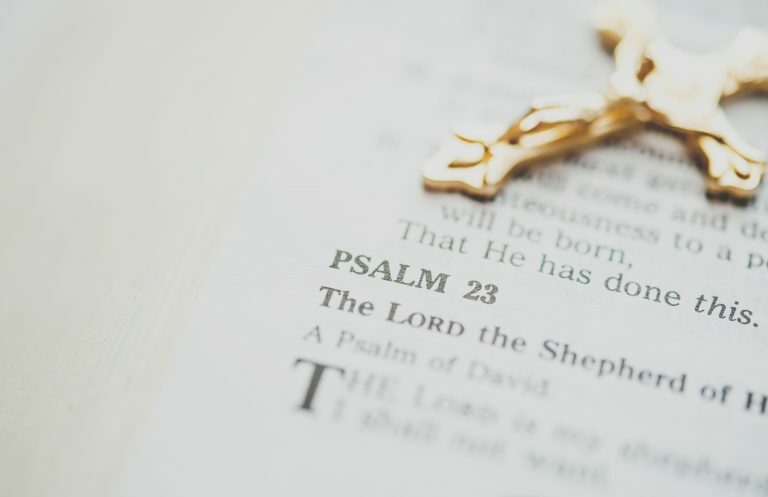 This article is adapted from “A Biblical Walk Through the Mass” in Scripture and the Mystery of the Mass, part of the Catholic for a Reason series.